Southampton strikes at "crucial stage"
No primary school academy in Lewisham! Hundreds of travellers face eviction from a site in Essex after the Home Office said it would cough up half the cash for a costly police operation. Local councillors on Basildon District Council voted in April to evict 96 families from the Dale Farm site near Crays Hill, Basildon. Essex Police estimated the cost of policing the eviction — not the actual operation itself — would be £9.2 million. Previously Basildon Council couldn’t afford that figure, so the travellers stayed in their homes, on their own land. An emergency motion passed unanimously at the Communication Workers Union conference called on sorting offices all over the country to refuse to handle mail from three London mail centres threatened with closure. This is likely to cause unofficial walkouts as union members get suspended for refusing to carry out an instruction from management. Council workers in Birmingham and Doncaster could join the mass public sector strike action on 30 June, as public sector union Unison announced ballots that could see 15,000 workers take strike action. Birmingham city council, Europe’s largest local authority, the city’s biggest single employer and the largest local authority employer in the UK, is planning to make £300 million cuts by 2015, including the axing of 7,000 jobs — nearly 40% of the total workforce. The Saltend workers’ dispute has come to a frustrating end after nearly three months. The 400 locked-out construction workers failed to win back their jobs at the refinery site in Hull after their employer Redhall Services Ltd was axed by the Vivergo consortium. Vivergo has improved the payout it was offering workers, and most have now accepted. Certainly, it would not have done that without sustained picketing at the site and other action elsewhere. Members of Unison and Unite (admin workers, cleaners, caterers, porters and security) at Sheffield University were on strike over pensions on 3 June. Management pushed through changes to their pension scheme at a university senate meeting without considering alternatives. The universities proposals rip the guts out of the pension scheme for its non-teaching staff, many of whom are low paid workers. The current system gives members half their final salary as their pension, but new proposals would leave members with a lot less than that. 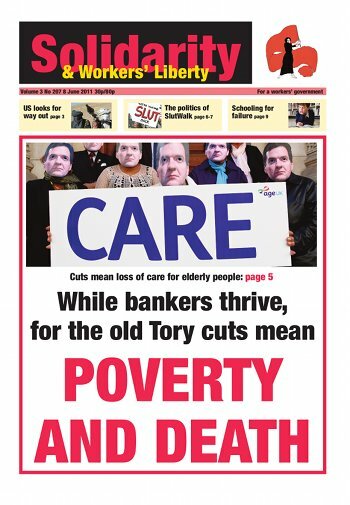 Monday June 13 will see a high point in ongoing anti-cuts strikes at Southampton City Council. On that day five sections involved in the rolling action will overlap for a day of coordinated strikes involving street cleaners, parking wardens, refuse collectors, bridge toll collectors and 250 hospital cleaners working for contractor Medirest at Southampton General. A joint Unison/Unite march is being held on June 13, starting at 12:30pm at Hoglands Park and marching to the Civic Centre. A speech by Lib Dem Business Secretary Vince Cable to the GMB union congress (5-9 June), was punctuated by boos, heckling and cat-calls. Later, the congress resolved to organise, and campaign for a yes vote in, a ballot of its public sector members for industrial action on pensions: not in time for 30 June, but maybe in the autumn. What do you do if your employers — citing dubious financial difficulties — proposes to sack 25 members of staff (out of 81)? Simple: you do as National Union of Teachers (NUT) members at Rawmarsh Community School did: organise for discontinuous industrial action, recruiting teachers from other unions as you go.